The year is 2025. You’re trying to pay attention to your nephew blowing out the candles on his birthday cake, but bright-red Facebook notifications keep flickering in your peripheral vision. The social media giant really wants its breakout hardware device to be a pair of augmented reality glasses. That’s according to the company’s head of AR, Ficus Kirkpatrick, who blabbed to TechCrunch during an AR event last week in LA. This isn’t the first sign that Facebook wants to dominate the AR space. It bought the breakout VR company Oculus in 2014. 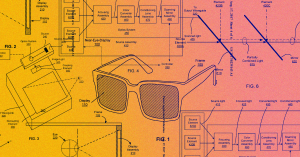 Last year, it filed a patent for what look an awful lot like smart spectacles. If heads-up glasses are the company’s next push, it’ll need to overcome decades of missteps in the space, from Nintendo’s disastrous Virtual Boy to Google’s failed-and-revived Project Glass. And Kirkpatrick cautioned to TechCrunch that the tech likely won’t be here for at least five years. If the company dreams up a compelling product, though, we’re all going to need to ask ourselves whether we want Facebook notifications clogging up our views as much as they already do our screens.